I was not one of the lucky students who did many science experiments back in my school days. But I know and appreciate their importance, even though I always think it’s going to be a bit cumbersome to experiment by myself at home. Fortunately, the days of simulating real-life activities on an iPad have come upon today’s generation of kids. It’s now easier than ever to create your own contraptions with Amazing Alex, or to perform your own science experiments with Piiig Labs. Piiig Labs comes with two groups of science experiments: red and blue. Red experiments come with an objective and a single correct way of completing each experiment. Blue experiments allow players to explore in constructing and altering the experiments. The first red experiment lets players set up a light bulb with a battery and a switch. First, players need to connect these devices using the cables. Then, they need to put on the battery and the bulb, before turning on the switch. The next two experiments in the red category teach players how to create an erupting volcano and a whirlpool inside a bottle. 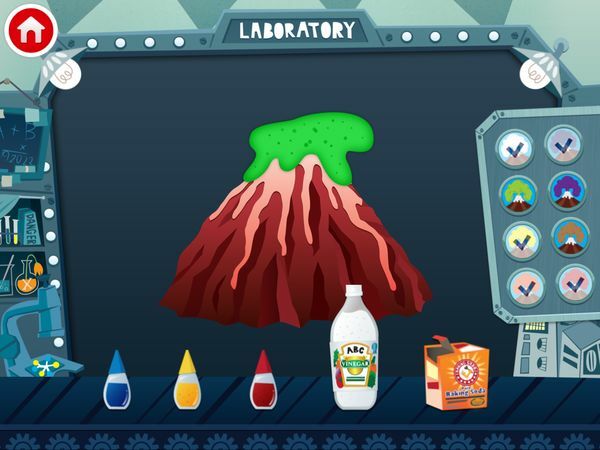 In the volcano experiment, players are provided with baking soda and vinegar required to create the volcanic eruption. In the latter experiment, players are provided with one bottle full of water, an empty bottle and a skullcap. It’s quite amazing to watch how these experiments perform scientific magic. One of the blue experiments lets players build on top of the previous volcano experiment by adding colors to the baking soda and vinegar mix. Using the three basic colors, they can try mixing to generate all six possible colors of volcanic eruptions. The other two blue experiments let players to match labels with popup animals to create their own popup animal toys, and assembling electronic parts to construct their own radio tuner. While it’s possible to disassemble your old popup animal toy and ask your juniors to reassemble them, it’s almost impossible to assemble your own radio tuner as simple as this app illustrates. The experiments included in Piiig Labs are relatively easy to figure out. They play a lot like jigsaw puzzles where players need to figure out which piece would fit in each placeholder. Judging by the simplicity, juniors ages 3+ can already enjoy the app. But when you judge the app by its contents, it’s perfect for juniors ages 7+ to build their interests in science experiments. Even though the app provides a brief narration when players pick up an item, juniors definitely need an adult’s guidance to understand the science lessons behind each experiment. For example, they may need to understand the roles of a battery, a switch, and the cables that connect these devices with the light bulb, in turning on the bulb. I really enjoyed playing with the blue experiments in Piiig Labs. Even though the exploration aspect of the experiments is a bit limited, the app a lot of fun and players get to learn by iterating through trial and error. For example, it’s nice to let juniors figure out which color mix creates the proper volcanic eruption or which label matches which popup animal. I especially like the last experiment where players can create their own analog radio receivers. It reminds me a lot of my late grandfather who was very good with analog watches, clocks, and radios. It always amazes me to see the inner-workings of such complicated devices. Yet the activity in this app is able to illustrate the complicated nature of the device in a simple manner. The fact that players can change the station by turning the tune dial is just icing on the cake. Piiig Labs brings science experiments from school labs into the comfort of our homes. Its activities are simple and intuitive enough for younger juniors, yet quite enlightening for older juniors who may have never performed such experiments. If you have been wondering how to let your juniors conduct their science experiments at home safely, you should definitely check Piiig Labs out.